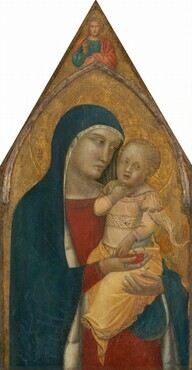 , “Pietro Lorenzetti/Saint Mary Magdalene, with an Angel [left panel]/probably 1340,” Italian Paintings of the Thirteenth and Fourteenth Centuries, NGA Online Editions, https://purl.org/nga/collection/artobject/891 (accessed April 18, 2019). 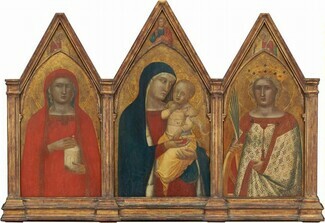 This painting belongs to a triptych, which also includes Madonna and Child, with the Blessing Christ [middle panel] and Saint Catherine of Alexandria, with an Angel [right panel]. The figure depicted here can be identified as Saint Mary Magdalene by the cylindrical vessel of ointment in her hand. In 14th-century Tuscan art, the ointment jar typically refers to the gospel story of the repentant women who anointed Christ's feet at the house of Simon the Pharisee. Mary is also one of the three women who went to Christ's tomb after the Sabbath to anoint his body and was the first witness to Christ's resurrection. 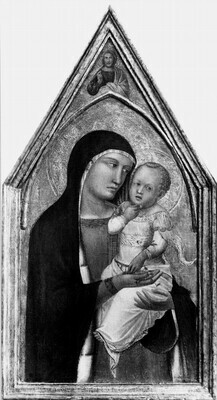 An inscription, which survives on a fragment of the original frame (now incorporated in a modern support and located beneath the triptych's central panel of Madonna and Child, with the Blessing Christ [middle panel]), records the artist's signature: Pietro Lorenzetti of Siena painted me in 1340. Pietro and his brother Ambrogio are often noted for the inventive ways in which they defined three-dimensional space and incorporated details from everyday life to expand the realism of their figures and settings. However, they also painted icon-like devotional pictures, such as this one. During this period, Pietro seems to have been especially influenced by Giotto (Florentine, c. 1265 - 1337), as seen in the quiet solemnity of the composition, in which a massive figure fills nearly the entire panel. The figure’s clothing also typifies Giotto's style: heavy fabrics fall perpendicularly in a few simplified or pointed folds to emphasize the figure's solidity. DeWald, Ernest T. "Pietro Lorenzetti." Art Studies 7 (1929): 162 n. 1, pl. 99. Cecchi, Emilio. Pietro Lorenzetti. Milan, 1930: 37, pl. 104. It is not clear when or how the fragment containing the inscription of the lost original frame was removed. It already had been removed from the original frame, and was incorporated into the frame that was on the painting when the current frame was commissioned in 1941–1942. The literature long ignored the inscription, probably due to difficulties in reading it. Its transcription was published for the first time in the NGA catalog of 1965, with the date interpreted as MCCCXXI. This was repeated in NGA 1985, although Charles Parkhurst had already sent the transcription to the Frick Art Reference Library and Robert Langton Douglas in 1946 (letters of August 1 and 2, 1946, copies in NGA curatorial files). Parkhurst’s reading was published by Fern Rusk Shapley (1979). See National Gallery of Art, Summary Catalogue of European Paintings and Sculpture (Washington, DC, 1965), 77; National Gallery of Art, European Paintings: An Illustrated Catalogue (Washington, DC, 1985), 232; Fern Rusk Shapley, Catalogue of the Italian Paintings, 2 vols. (Washington, DC, 1979), 1:269–270. Burton B. Fredericksen and Federico Zeri, Census of Pre-­Nineteenth-­Century Italian Paintings in North American Public Collections (Cambridge, MA, 1972), 109, 312, 429, 646; Michel Laclotte, “Un ‘Saint Evêque’ de Pietro Lorenzetti,”Paragone 27 (1976): 18 n. 7; Mojmir Svatopluk Frinta, “Deletions from the Oeuvre of Pietro Lorenzetti and Related Works by the Master of the Beata Umilità, Mino Parcis da Siena and Iacopo di Mino del Pellicciaio,” Mitteilungen des Kunsthistorischen Institutes in Florenz 20 (1976): 290.